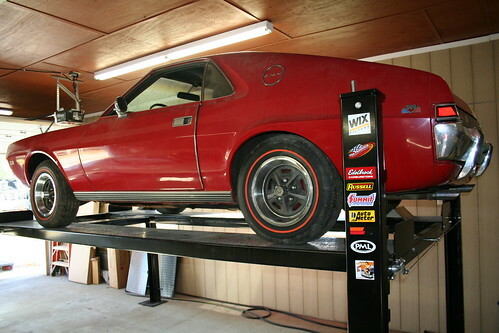 We have added a new Project AMX to our garage. It replaces the previous car which has since been sold to a new owner who will be completing it. We had the opportunity to pick up an excellent Barn Find but had to move one of our Project Cars out to make room for the new AMX. Since an AMX was moving in we thought it best to move an AMX out. The following is an overview of this new Project. Muscle Cars were never meant to be museum quality art work; they are cars, and they were intended to be driven and driven hard on the street or the race track. When a new Muscle Car was purchased back in the day very few people went home with the goal of preserving the chalk marks on the firewall or keeping the total lifetime mileage under 5,000. Maybe those are the cars that bring big money at the Barrett Jackson Auction in Scottsdale but the cars that were driven and modified are the ones that brought big smiles to their owners then and still do today. Most asked question: What’s an AMX? This AMX was born as a very desirable and rare 343 cubic inch Go Pack car with 4 Speed, air conditioning and Group 15 option package. The original owner sold the car a few months after purchasing it because, as we were told the story, his Government called him to serve in Vietnam. When the second owner purchased the AMX it was a fast and desirable car, but not fast enough. The new owner soon purchased a period correct replacement 390 cubic inch engine and performance engine parts from the factory engineered, dealer available Group 19 package. This package included improved heads, aluminum Edelbrock intake manifold (with AMC part number), exhaust headers, Holly carburetor, high performance cam and modified air cleaner. Other options available from the dealer but not purchased for this car included: side exhaust pipes, roller rockers, various rear gears as well as 4 wheel disk brakes. The second owner installed the Group 19 goodies on the 343 engine. The 390 sat in the corner waiting for its turn. By 1981 the AMX had performed well but it was time for the 390. The car was pulled into the barn and the initial engine removal was begun but never completed. A few years after purchasing the car the new owner also repainted the AMX from its factory white with blue stripe paint scheme to his preferred red with white stripe scheme. If you want to learn more about AMX cars in general, Click Here. A real honest BARN FIND! After a fun decade of regular use in 1981 this AMX was put to bed in an Alabama barn with approximately 62,000 miles on the odometer. It sat in this location until I, the third owner, purchased the car. This is my first true Barn Find and it was an exciting experience. I will tell you more of the find later but for now, it was taken to its new home with 28 years of dust on the interior and exterior but in rust free and very solid condition. It was now time to begin a new chapter in this car’s life. In 1969 I went down to the local AMC dealer and filled out an order form for my dream AMX. Unfortunately, a check was never attached and the order was never placed due to an Army based uncertain future. What was my dream? A red with white stripe 390 Go Pack car with 4-speed, air conditioning, redline tires, dealer installed Group 19 performance items plus a set of American Torque Thrust wheels. In essence the car you see here. Some people want to go back and find their first car, I have always wanted to own the first car I lusted after but couldn’t have. Now I do! It isn’t factory original but it is better and it is just like that dream car I would have ordered and modified in 1969! This AMX will not be put back factory original, it will not be nut and bolt correct but it will be built the way I want it and the way you saw muscle cars on the street in 1969. And; believe me, this car is going to see a lot of street time! As I was doing the first inspection of the AMX and was cleaning the interior I was excited about all the things I am planning to do with this new ride and all the great places it is going to take me. However, I also began to wonder where that original owner is today? Did he make it back from Vietnam? Does he own an AMX today? YOU CAN TRACK ITS RESTORATION PROGRESS BY CLICKING HERE. I am the barn owner. This car was taken off the road because the Group 19 modifications with the attendant very high compression would not operate properly with the poor gasoline of 1981. In its heyday it was faster than a regular 390 by far. The 390 was purchased as a replacement for the 343 because I didn’t wish to take the 343 apart and so a straight exchange was contemplated to solve my poor gasoline problems. I had other stock 390 AMC’s that ran well on the current gasoline. While it sat beginning in 1981 my wife wanted a fast AMX and I built her two; a 1968 and a 1974. An important show was looming up for the 1968 car and I used the intake for that car while I continued to serch for another intake. The bumper was used on her car as the one that was replated for it was unsatisfactory and had to be sent back. When I got the replacement parts for my car they were stored and were sold with it just this year. The car was repainted around 1977. Even though I trusted a friend with a fine body shop, the repaint was not what I had hoped. It appears that the preparation was poor as the body was excellent with never any damage or rust. The car has always resided with me in Oklahoma and Alabama. The paint is enamel with a hardner, but faded quickly. While it needs a headliner (the foam between the vinyl and the formed board deteriorated), the remainder of the interior should clean up well. The carpet may need dying; particularly in the rear with that large back window allowing lots of sunlight to enter the car. The interior is charcoal even though it appears as black. Everything worked very well when it was parked, but the brakes and tires are not to be trusted after such a long storage. I wouold also imagine that everything needs to be lubricated. The AC may be low on freon by now. A change to R-34 might be advisable. These cars are great drivers and fine sports cars. I would definitely compare it to an early Shelby Mustang. This car is late enouigh in production that it has all of the updates from AMC including a Hurst Competition Plus shifter, hooded instruments, full woodgraining and suspension and wheel improvements. It also has all the accessories including tilt, AC, Go-Pak on 343ci engine (disk brakes, traction bars, heavy duty cooling, posi 354 rear end, Magnum 500 wheels, and heavy duty suspension), Am 8-Track radio with dual rear speakers, outside matching mirrors, extra interior lighting, clock, tilt mirror, visor mirrors, fold down center seat armrest and rear bumper guards. It doesn’t have AM/FM, automatic or leather seats. I added most of the Grooup 19 items in my first year of ownership. I am very pleased that Richard now has this car. It definitely was to be the very last thing for which I wanted part. My wife’s health convinced me that I should sell it. Richard will appreciate it as one of the few AMX’s that need so little work and is so original (outside of the engine modifications). It does represent a car of the 1960’s, but with no racing or abuse history. After reading Richards commentary on it I am assured that I did not make a mistake in its new home. I definitely had no trouble in turning others away both now and over the years. Bill, thank you for your comments. Rest assured that the AMX is in good hands and will have a sweet new life. I got one two a 69 amx 390 4 speed — biggest piece of junk unreliable car that I’ve ever owned, bought it in 1980,got it for sale on craigslist— listed under south fla, can’t get 6 thousand for it, probably ain’t worth scrap metal, because of old rust issues, my advice is to junk it, save your time and money—- thier garbage!!! Gator, wow sorry for your bad experience with the AMX. I must say that at least 95% of the people that I talk to about the AMX think it is a fantastic car and a great buy in today’s economy. However, I do understand your issues. If someone patched together a car that had previous significant rust issues or mechanical issues you can be in for a world of hurt. I can also tell you from personal experience that every brand and every model has some lemons out there. I love Corvettes and have had fantastic experiences with most of them but there have been one or two that were absolutely not worth the work. Hope you have better luck with your next project. I have to say that I also found an amx in a barn, and bought it. I bought it when I was 13 years old. I raked alot of leaves when I was young and made one of the best envestments ever in my opinion. I am 34 now and I still own the car today. Its weird sometimes to tell people that I am 34 and have owned the same car for over 20 years. Its also funny when everyone who knows me like to ask if its for sale, damn well knowing its not. My car is Hialeah Yellow with the 390 GO Pak. plack nmbr 1290. The last thing is a question for “Gator.” What craigslist were you on in 1980? It really is best that you got rid of yours. You should look into buying a Camaro or Mustang that way you are just like all the other sheep, and you can feel secure. American Motors all the way baby! A friend and I have owned many Javelins, and for both of us, they were our 1st cars. 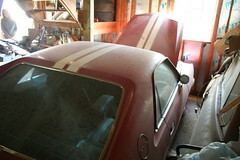 His, a ’71 AMX, is still is in his possesion in need of restoration. I’ve loved AMX’s and the Javelins, and hope someday to own a true AMX. They are so very hard to find in decent condition due to their age. Wonderful drivers and certain head turners! Best Luck to all AMC fans in your projects, that you can keep these rolling works of art on the road for everyone to admire! Cory, our AMX has just had the engine installed and trying to get it running but too many other projects keep getting in the way. Watch for an update soon. Sounds like your dad would be an interesting and helpful person to talk with. Thanks for the info. Growing up ,I used to see all kinds of 20`s 30s 40s sitting around yards; A guy I knew used to get `em cheap,his dad was big into Model As and had parts galore into the 80`s then he went Stude and sold it all?…..his Son had a 32 roadster hot rod and 29 pickup w/283 and moved them to Arizona.he passed away a few years ago,so don`t know what ever happened to his Wife or his cars. 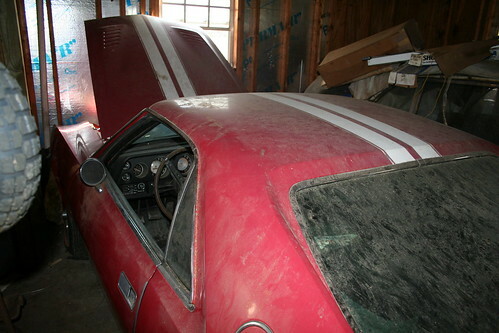 would like to find the value of barn find 1968 amx 390 go pkg. all red car no stripes just chrome along bottom.thank you ! Mitch, I would not even venture to guess what the value of the car might be without seeing it in person. So much depends on the condition, originality etc. I suggest you try the Valuation Tool the Hagerty Ins. has. Just do a search for their web site.